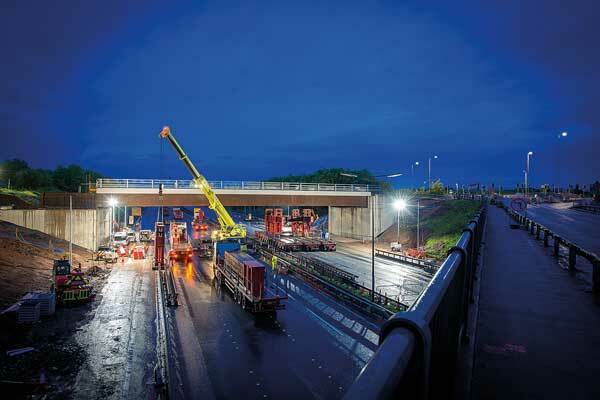 A new bridge that forms an important part of infrastructure works for the SEGRO Logistics Park East Midlands Gateway has been successfully launched across the M1 motorway. The steel composite bridge was fabricated by Cleveland Bridge and assembled on a site adjacent to its final position. During a weekend-long operation, the completed bridge, which weighed almost 1,200t, was installed using a Self-Propelled Mobile Transporter. SEGRO’s Business Unit Director, National Logistics Andrew Pilsworth said: “The successful installation is the result of an extensive programme of planning and coordination with our partners. As well diverting traffic away from the village, the bridge is a vital part of infrastructure for SEGRO’s 700-acre inland port, which will accommodate numerous distribution centres and create 7,000 jobs.